"Pangs and sorrows shall take hold of them. They shall be in pain as a woman that travaileth." Hear now all of ye that The Bible commences, as it must, with the Old Testament story of Creation. Soon, Adam (Michael Parks) appears, followed closely by Eve (Ulla Bergryd); cast from the Garden of Eden by the Lord's mighty wrath, they beget two sons, Cain (Richard Harris) and Abel (Franco Nero). Cain murders Abel; later, Noah (John Huston) is charged with the creation of an Ark, protecting his family and two of every species from the great flood God sends to destroy the evil and the iniquitous. Forty days, forty nights, and a good hour of screen time pass, whereupon a great Intermission is experienced by a grateful audience. King Nimrod (Stephen Boyd) constructs the Tower of Babel and is rebuffed by the Creator. Abraham (George C. Scott) and his wife Sarah (Ava Gardner) fret over their childlessness, until human machinations and divine intervention conspire to initiate a vast line of descendants. Three avenging angels (all portrayed by Peter O'Toole) descend on Sodom and Gomorrah. Lot's wife is turned into a pillar of salt. Abraham obeys God's order to sacrifice his dearly beloved son Isaac, and his compliance proves his faith and spares the life of his son. The End. 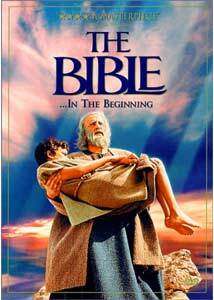 Clearly, The Bible is a misleading title, as this nearly three-hour film encompasses only the first twenty-two chapters of Genesis. And therein lies the rub�producer Dino De Laurentiis and director John Huston approach the subject with a stately, reverential pace that's a mite too stately and far too reverential. The stories retold here suffer from the Dracula syndrome that afflicts most cinematic incarnations of Bram Stoker's antihero�the broad outlines of the action are so familiar to most people that there's no drama in watching it unfold onscreen. Every moment unfolds with careful attention to gesture and detail, attention that might have been better devoted to finding the human drama and establishing a more watchable pace. The production does have its strengths, to be sure. George C. Scott brings admirable weight and commitment to his portrayal of Abraham over several decades of his life, and Richard Harris communicates Cain's uncontrolled emotions and bewildered guilt with an animal posture and childish gestures. John Huston plays Noah with a wonderfully loopy demeanor, providing the film's only truly humorous moments, and Peter O'Toole blends amusement and divine outrage with a dash of barely-concealed superiority. John Huston also appears as the Voice of God, an eccentric but not wholly inappropriate bit of casting. The physical production is suitably impressive. De Laurentiis spared no expense, hiring hundreds of extras (no CG crowds here) and building massive sets�practical cities, a Tower of Babel and an Ark, only moderately augmented by matte paintings. Costumes are occasionally gaudy, but Biblical enough, and special effects are generally solid, especially the transformation of Lot's wife�a simple dissolve leaves a flaking, unsettling, only vaguely human form where the unnamed woman once stood. Large-scale battle scenes and panoramic location vistas lend The Bible an epic feel that rivals any other sword-and-sandal studio production. But there's little here to involve an audience. The perspective is conventional, the story overly familiar, and the pacing deadly dull. One obviously approaches a subject like The Bible with the greatest of care; nothing here is likely to offend anyone raised in the Judeo-Christian tradition, but that's a faint recommendation at best. The time one might invest watching The Bible would be better spent reading the book of Genesis�and considerably shorter. Image Transfer Review: The Bible was filmed in the "Dimension 150" widescreen process, retaining its slightly unusual 2.2:1 aspect ratio on DVD. Fox's anamorphic transfer is drawn from a clean, minimally damaged source print, but the 1966 film shows its age�many scenes have a soft look, and darker shots suffer from color shifts, heavy grain and a general shadowy murkiness. Light levels vary in a number of scenes, and the film's colors seem faded and dull. Most of the visible flaws are inherent to the original production and/or the source print; the dual-layer digital transfer is competent, and many shots look just fine. But this spectacle-driven movie isn't quite as impressive on DVD as one might expect. Audio Transfer Review: The Bible disc includes the film's original monaural English and dubbed French soundtracks, but the real attraction here is the Dolby 4.0 rendition of the film's multi-channel roadshow soundtrack, heard in few venues during the film's original release. The 4-channel mix (billed only as "stereo" on the keepcase) sounds quite clean and features strong left/right/front imaging, with a subtle mono surround channel. Dialogue is generally centered, with music occupying the rest of the soundstage; bass is fairly strong, and a few sound effects make expansive use of the front soundstage. The mono tracks are significantly flatter and audibly noisier, apparently not as well-preserved as the roadshow track; the French dub is appropriate to the film's tone and fairly well-acted. It's a dated soundtrack in many ways, but the discrete 4.0 track presents The Bible at its best, sure to please purists and surround addicts alike. Extras Review: The Bible on DVD features 21 picture-menu chapter stops, optional English and Spanish subtitles, and no supplements beyond a handful of trailers. The Theatrical Trailer is presented in 2.35:1 letterboxed nonanamorphic format, with Dolby 2.0 monaural audio. The trailer is in poor condition, but its heavy-handed stars-and-spectacles approach has some entertainment value, stopping just short of insisting that God wants you to see The Bible. The Bible (actually, a portion of the Book of Genesis) unfolds with stateliness, extravagance, and a pace that would try the patience of Job. Fox's DVD features a decent transfer (with solid audio), but the film suffers from an excess of reverence at the expense of entertainment. An epic production, but difficult to recommend.